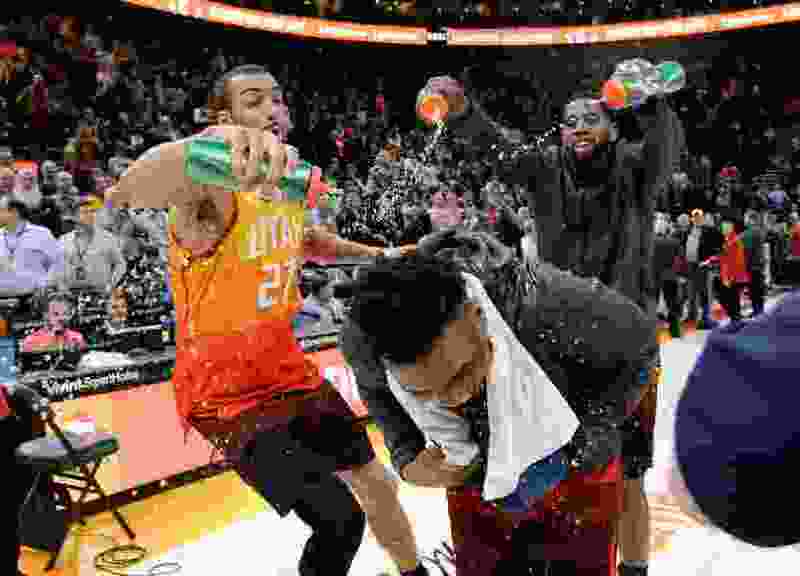 (Francisco Kjolseth | Tribune file photo) Utah Jazz center Rudy Gobert (27) and Utah Jazz forward Royce O'Neale (23) spray Utah Jazz guard Donovan Mitchell (45) with water as he does an interview celebrating his career high game of 46 points for the second time. So, the Utah Jazz. What a great year. No, wonderful year! Wow! Thanks for all your hard work and so many fun games. Thanks for the message that you have delivered this year, that you guys really like your teammates. It comes over to us, the fans. I have also noticed that you stay on the floor after the game and visit with the other members. You guys have a lot of class. You are a unique bunch of great young men. All of you guys are so special, talented and just amazing to watch. Thanks to the coach for an amazing season as well. The Jazz have made a long, cold winter very memorable! Your fans thank you! Good luck in the playoffs. Go Jazz!